Braver Than You Believe Silver Bracelet LONG QUOTE This Christopher Robin / Winnie the Pooh quote is perfect to remind someone that they are smart and strong and brave. That they can accomplish anything. 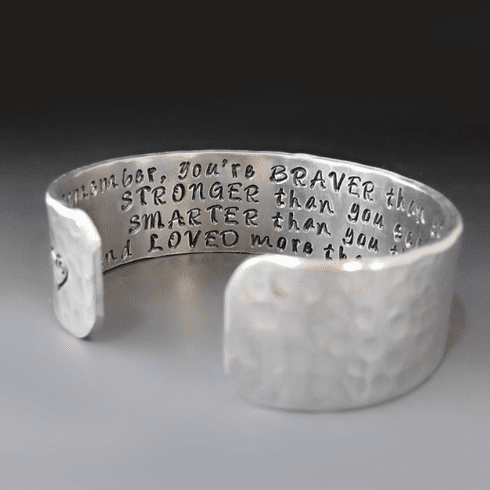 This cuff is shown with the long quote. Click here to see the Original Cuff . and LOVED more than you know. Your choice of image(s) can be added to the outside edges of the cuff as a visual reminder of your power. This bracelet is great alone or as a layering piece. This bracelet is 6 inches long and has a 1 inch gap for sliding off and on your wrist. It fits most average size wrists and is slightly adjustable. NEED A DIFFERENT SIZE? This cuff can be made smaller or larger. Please contact me to discuss your options. The bracelet is lightweight and very easy to wear. It is made with 100% pure aluminum and will not tarnish or cause reactions due to nickel allergies. It can be adjusted to fit most wrists. All Personalized / Custom items are a final sale and cannot be returned or exchanged. I personally hand stamp my pieces. Each letter, number and symbol is created using individual letter stamping tools. Variations in spacing and letter/number alignment may occur. These differences should not been seen as defects, but rather adding to the charm and uniqueness of each piece. Create a piece that speaks to your soul. Copyright String of Jewels. All Rights Reserved. Shop StringOfJewels in complete confidence. You are protected by the world class security of Yahoo! Stores Secure Shopping.